Last July, this intrepid astro photographer set off on an epic adventure in search of that most wonderful of astronomical events - a total lunar eclipse. The long lens was hired. The location picked. The anticipation was building. And the cloud spoiled all our fun. You can read the sad tale in this blog. But, the one crumb of comfort I had was this - having waited three years from my last eclipse, I would only have to wait a mere 5 months for another go. And, here we are, five months later, about to try all over again! Anyway, before we get into that, let’s look into what actually happens when an eclipse occurs. With a clear view towards the west, this is what you will expect to see. The eclipse occurs as the Moon passes into the shadow of the Earth. The first thing you would see is a slight darkening of the Moon as it heads into the penumbra shadow of the Earth (see below diagram). Then, as the Moon edges into the full shadow of the Earth (known as the umbra) you would begin to see a 'bite' being being taken out of the Moon, as the shadow of the Earth covers an increasing amount of our satellite. Finally, the Moon passes entirely into the umbra and is not being lit any more directly by the Sun. It’s at this stage that you might think the Moon will disappear. In fact, it doesn’t. To the ancients, having watched the Moon being gobbled up, it might seem like the next stage is some form of grizzly aftermath of a celestial conflict, as the Moon turned blood red before their very eyes. Penumbral eclipse: the Moon passes through the penumbra of the Earth - the only observable impact on the Moon is that it becomes slightly darker than when it was outside the penumbral shadow. 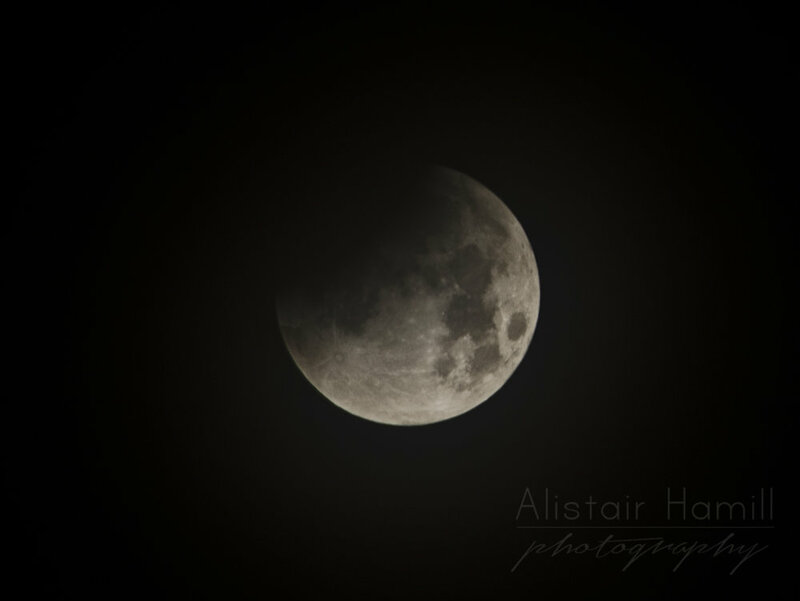 Partial eclipse: part of the Moon passes through the umbra - the effect on the Moon is the 'bite' out of it, as the Earth's shadow passes over the Moon. Total eclipse: the whole of the Moon passes through the umbra - at its most pronounced stage, the whole of the Moon can turn blood red. Why does the Moon go red? So where does this erie red light come from? It’s still sunlight, but this time refracted through the Earth's atmosphere. The effect is similar to that which gives us red skies at sunset and sunrise. As the Sun’s rays pass through more of the atmosphere at the start and end of the day, the blue light is scattered more and only the red wavelengths of light reach us. Similarly, the light shining on the Earth is refracted by our atmosphere, bent around to our dark side, and then on to the Moon. And, once again, the blue light is scattered and the red light is the wavelength that is bent round and then sent on to the Moon. As the Moon slowly makes its way out of the umbra and into the penumbra again, at first you will see a sliver on the edge of the Moon brighten noticeably. Then the Moon will get brighter as it is increasingly lit partially by the direct light of the penumbra, and the red colour disappears. Gradually, the shadow will grow ever smaller and eventually disappear, and our Moon will return to normal. Here comes the bad news. Unlike last July’s event, when the Moon rose in totality, if you want to enjoy this amazing spectacle, you’ll need to get up in the middle of the night! Totality starts at around a quarter to five in the morning, and lasts for about an hour. Prior to that, you’ll get to see the bite taken out of the Moon, starting at the top right - and after it, the Earth’s shadow will slowly retreat to the top left of the Moon. Get the longest zoom lens you can, preferably at least 200 mm zoom. During this stage, the Moon is still quite bright. So, short exposures, the kind of which you would use during the day, and lower ISO settings should work fine. You will need to increase the shutter speed. But here’s your challenge - you’ll be using a longer focal length for more detail. But the longer the focal length, the shorter the shutter speed you can select before the motion of the Moon will cause it to blur. So, to get your exposure right, you’ll need to increase your ISO. Experiment with this, checking your histogram after each shot, and get the combination of settings right to expose for this darker Moon. AND WHAT ABOUT THE WEATHER…?! A ridge of high pressure is due to build over Northern Ireland overnight on Sunday - this normally brings pretty clear skies, although being just after a cold front means there might be some broken cloud. But, all things considered, this is a pretty good context. BUT… waiting in the wings to the west is the next depression, just waiting to approach. As depressions approach, normally they bring wispy cirrus cloud first. We’d still be able to see through this. But, as they get closer, the cloud thickens and forms more continuous cover. The big question is: will the eclipse happen before the cloud arrives. There’s only one way to find out - see you out there? !